At Partners in Printing, we have the ability to offer you all your label requirements. We are committed towards making high quality, affordable and professional labels to meet your business needs. Most labels have different characteristics dependent upon the application. We will take time to analyze your application and determine the best label solution. 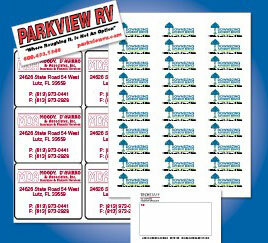 Our labels can create a sophisticated look to your business mailings, shipping or product packaging. Choose all types from Short Run Digital Full Color labels to Laser/Ink Jet, Die-Cut, Roll, Domed, Weatherproof, Bumper Stickers and Static-Cling. We can assist you in determining your proper label needs.